Nicht weniger als "The Complete Guide To Skin Picking Disorders" verspricht US-Autor David Florendale, ein ehemals Betroffener. Bestellbar über Amazon, Preis: satte $ 49,95. "Stop Picking Start Living: Identify Your Symptom, Find Your Cause, Treat Your Case. 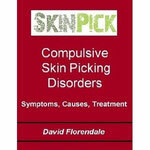 This book provides in-depth information about the compulsive skin picking disorder. By reading it you will learn about effective treatment methods, different symptoms and variations of the disorder, possible causes and triggers and more. The author, David Florendale, holds valuable record in researching Dermatillomania and related disorders."